The Pawtucket Foundation of Pawtucket, RI, is the central advocate for the business and nonprofit organizations of this historic city. Each spring, the Foundation holds its Annual Awards celebration in recognition of individuals and organizations significantly shaping the city’s success. Ahlers Designs has designed several awards in celebration of the Pawtucket Foundation annual awards event. 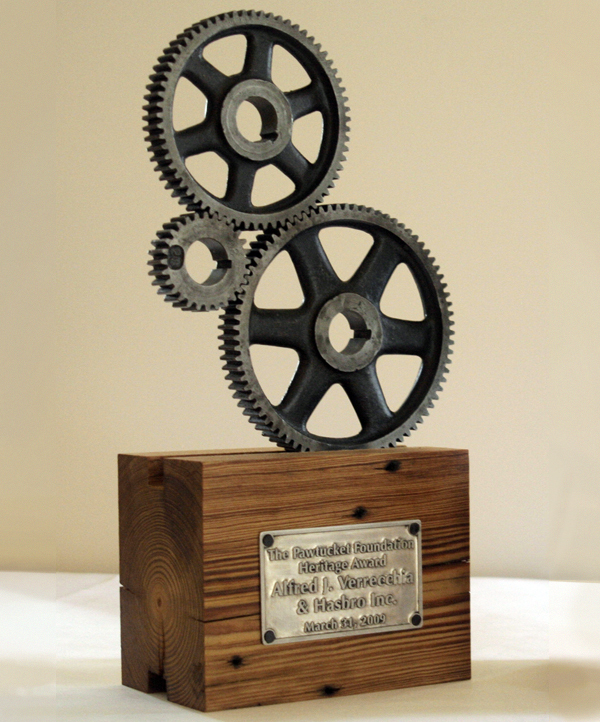 The Gear Sculpture was presented at Pawtucket’s “History of Industry and Innovation” event. Gail created the gear sculpture by utilizing reclaimed machine gears found in a Rhode Island factory. The striking sculpture was mounted on a solid wood base that was previously a factory beam. The Rhode Island Cherry Blossom Festival focuses on the Foundations core values of collaboration, vision, and sustainability. Gail created the cherry blossom sculpture by cutting recycled cans, obtained from local Narragansett Brewery, into petal shapes, which she hand paints and layers into blossoms. The branches were wrought from steel and finished with an alluring patina. Gorgeous reclaimed lumber was sourced from Pawtucket Mills to build the durable frames for these bespoke, local, and environmentally friendly sculptures that reflect the vitality of the city.